Transitioning to civilian life can be challenging on many fronts, including financially. 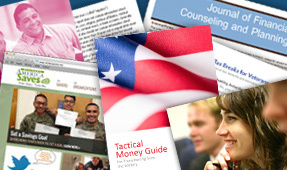 The Veterans Financial Coalition members offer free educational and consumer advocacy resources to help veterans navigate the unique challenges they face and achieve solid financial footing for future success. Veterans Financial Coalition is a diverse group of organizations with the shared goal of serving the financial education and consumer protection needs of veterans. The coalition's mission is to assist and promote resources to a growing population of veterans, provide financial education for veterans and community organizations serving veterans, and raise awareness of the unique financial challenges our nation's veterans face. As you prepare to transition into civilian life after serving in the armed forces, learn more about how to ensure your family's future financial security and what resources are available to you. 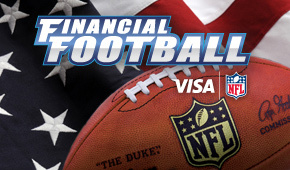 Give your financial knowledge a workout with the new Financial Football, a fast-paced, NFL-themed video game developed by Visa. Just answer financial questions to advance down the field and score touchdowns. 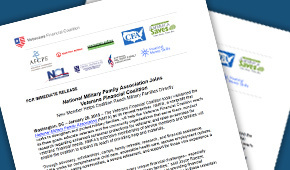 A new coalition was formed to serve the financial needs of veterans returning to civilian life.